Gaining weight around the midsection must be done through eating select food types and avoiding any activity whatsoever. This is not a difficult plan to undertake -- but not a healthy solution to any person's particular circumstance -- and can be done quickly and effortlessly. Applying these specific eatables into your daily eating regimen will produce dramatic weight gain around the abdomen creating a Santa Claus effect on your belly. Forget about portion control. Gaining weight is all about putting more calories into the body than you use for energy for your body. Eating large quantities of food will pack on the pounds quickly, even within a week, as 3,000 to 3,200 calories equals 1 pound of fat. A study in the February 2014 issue of "Obesity" reports that eating a lunch that contains 1,600 calories causes significant weight gain. 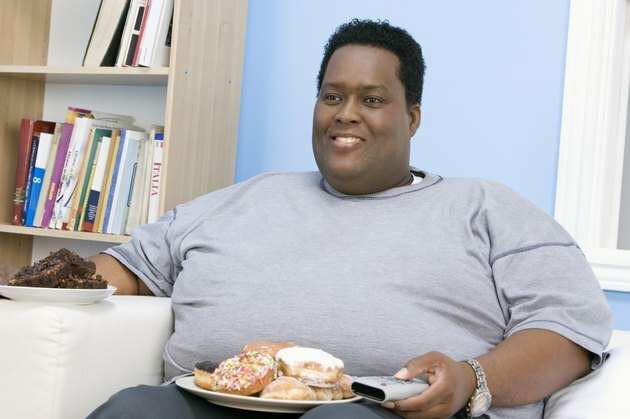 Before you set out to become obese, you should know that the World Health Organization lists obesity as the fifth leading cause of death world-wide. Eat a wide range of highly processed, sugar and fat laden foods such as doughnuts, candies, white bread and fatty meats. These foods are loaded with metabolism restricting compounds and preservatives that the body has a hard time processing. Sugar or saturated fats by themselves can offer weight gain, but when combined in many snack foods like doughnuts, cookies and breads, weight gain around the belly is quick. Be aware that consuming processed foods high in preservatives -- particularly meats -- increase your risk of cancer and heart disease significantly, according to a study in the 2013 issue of "BioMed Central." Drink ample amounts of sodas, beers and coffee drinks. These beverages are not only full of simple sugars, but also high fructose corn syrup, alcohol and food colorings. All these attributes create fat stores that will stick around the abdomen and lower belly. The December 2013 issue of "Cancer Epidemiology, Biomarkers and Prevention" warns that sugary drinks increase your risk of developing type 2 diabetes and endometrial cancer, along with obesity. Avoid physical activity or energy expenditure. Exertion requires calories, and weight gain continues when calories remain abundant without being lost to physical activity. Reduced activity will spur on the development of both visceral and subcutaneous fat that appears just below the skin, comments experts with TheFactsAboutFitness website. Reducing your activity, however, may do more than help you gain a few pounds. A study in the February 2014 issue of "The International Journal of Behavioral Nutrition and Physical Activity" warns that prolonged sedentary behavior, particularly sitting, may contribute to heart disease and an untimely death from multiple causes. This eating and lifestyle plan will lead to disease and even death if continued for any length of time. Annecollins: How Do You Reduce A Fat Belly?